Heat oven to 375°F. Grease 13x9-inch (3-quart) glass baking dish with shortening or cooking spray. In medium bowl, mix chicken and 1/2 cup of the enchilada sauce. Separate or cut dough into 4 rectangles (if using crescent rolls, press perforations to seal). Spoon chicken mixture and 1 tablespoon of the cheese onto 1 long side of each rectangle. Roll up. Place seam side down in baking dish about 1 inch apart. Bake 20 minutes. Carefully remove dish from oven. Sprinkle with remaining cheese, and return to oven. Bake 2 to 4 minutes longer or until cheese melts. Meanwhile, microwave remaining sauce in microwavable glass measuring cup uncovered on High in 30-second intervals until hot. 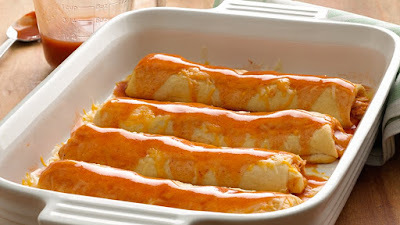 Drizzle over enchiladas.